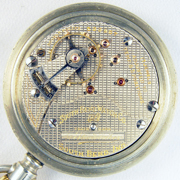 South Bend Watch Co. 18 size 17 jewel open face lever-set Grade 323 "The Studebaker". Very attractive high grade movement with gold jewel settings, gold balance screws, and crosshatch pattern damaskeen. Fronted by a double-sunk enamel dial and housed in a SBWCo. (South Bend Watch Co.) marked "Silvaloy" recase. Movement serial number is 533967. Running and a very nice looking movement with excellent color and luster. Dial with numerous scattered hairlines. Hands with oxide and finish loss. Case is in solid condition overall with a few dings on its band around the 8 O'clock to 9 O'clock area and with some spotty tarnish. Thin glass crystal has glue excess around its perimeter.